With wedding season in full swing, it’s likely you have some gifting to do. Whether you’re a bride-to-be or a wedding guest, BHLDN has some unique gift ideas that are sure to stand out. For the bride: Surprise the bride with a little something to alleviate any stress she might feel on her big day with the Bridetastic Emergency Kit. It will cover any unforeseen hiccups, from a snagged hem to a chipped nail. And as a groom, surprise your bride with something extra special that she can later pass on as a family heirloom. Perhaps a beautiful piece of jewelry like the Nerea Crystal Necklace or a personalized keepsake like the Etched Momento Box. For the groom: It’s tradition for the bride to give her groom a little something before they walk down the aisle. What better way to say I love you than with an understated accessory he can wear to the ceremony and will treasure for years to come? Minimalist and modern, we love the XO Cufflinks and Best Day Ever Tie Clip. Add a a sweet love note and he’s sure to get a little teary-eyed. For your mom: Weddings are a big deal for moms, but especially for the mother of the bride. Thank her for everything she’s done over the years with a handmade Mother Pendant Necklace . It doesn’t hurt to have a tissue handy either, which makes the Mother Kerchief another beautiful option. For your dad: Thank your dad for always being there with something sentimental, but practical. We love the No One Can Fill My Father’s Shoe Horn, engraved in brass with a leather strap and great for helping him get on those dress shoes, or the Father Chambray Kerchief. For your bridesmaids: Show your gal pals how thankful you are for their involvement in your big day with jewelry they can wear to the wedding, like the Felicity Gift Set, which includes freshwater pearl earrings and a matching necklace. Another great option – and perfect for pre-ceremony primping – is the Botanical Garden Robe. Your wedding photos will be a hit! For your groomsmen: From your best man to your ring bearer, say thank you for their support with the How To Be A Gentleman Kit. For your flower girls: Thank the youngest in your bridal party with the stylish Girl’s Garden Robe or Pressed Flower Necklace. They’ll feel all grown up and will give them keepsake of your special day. 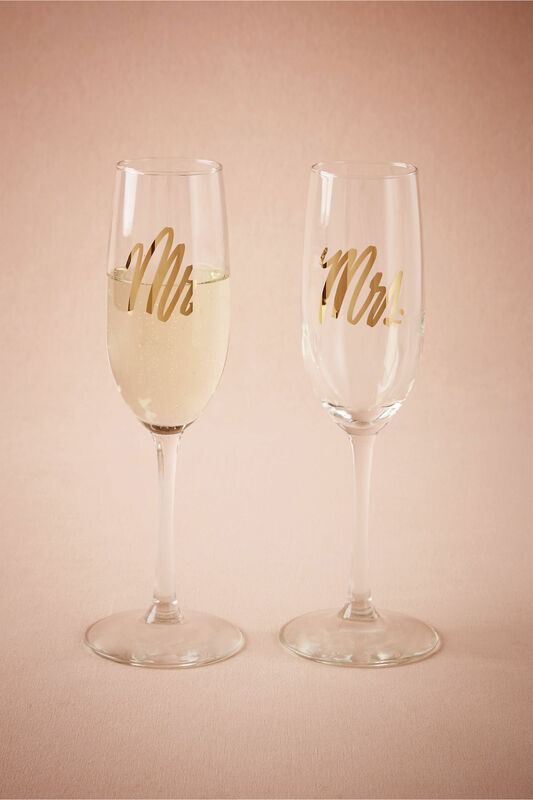 For the happy couple: There’s no feeling quite like seeing smiles on the bride and groom’s faces when they walk down the aisle as newly proclaimed “Mr.” and “Mrs.” When it comes to finding the perfect gift for celebrating their love, get something that they’ll enjoy for years to come like the Mr. and Mrs. Champagne Flutes or a Honeymoon Photo Album. 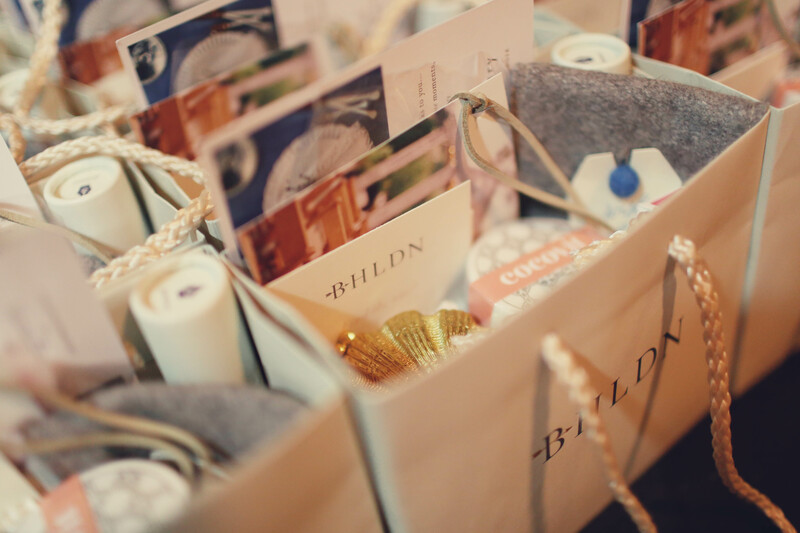 Click here to check out all of BHLDN’s great gift ideas.